Not too long ago, I bought a new car. 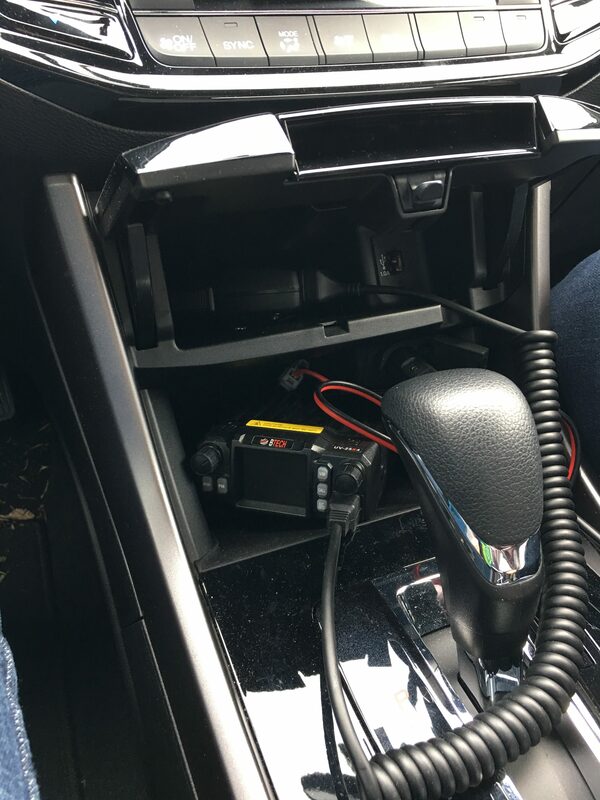 My old car was a mobile shack, having an HF radio mounted in it. It was great. I could stop anywhere and work HF stations all over the world. While I was driving, I could listen to my local repeaters on the VHF or UHF bands that were built into the radio. Now that I had a new car without a radio, I began to miss having the VHF and UHF bands while I drive. In my garage, I have a collection of antenna parts. In my shack, I have a collection of radios. Surely, I could come up with an installation that would at least give me local repeaters with minimal effort. You may not have a collection of parts laying around. At the end of this article is a list of the parts that I used and a list of parts that cost less than what I used. The magnetic-mount base and triband antenna.I always start by thinking about the antenna, mainly because getting the antenna outside of the metal shell of the car greatly increases the effectiveness of your install when compared to having a handheld radio inside the car. In my case, I had a magnetic-mount NMO antenna base laying around the garage. This type of mount is a magnetic disk with an NMO connector on the top and a coaxial cable running out of the side of the base to a PL-259 connector. The magnet holds the antenna on the roof or trunk of the car (because the car is metal). These are great because you can replace the antenna without having to dispose of the magnetic base if the antenna becomes damaged. 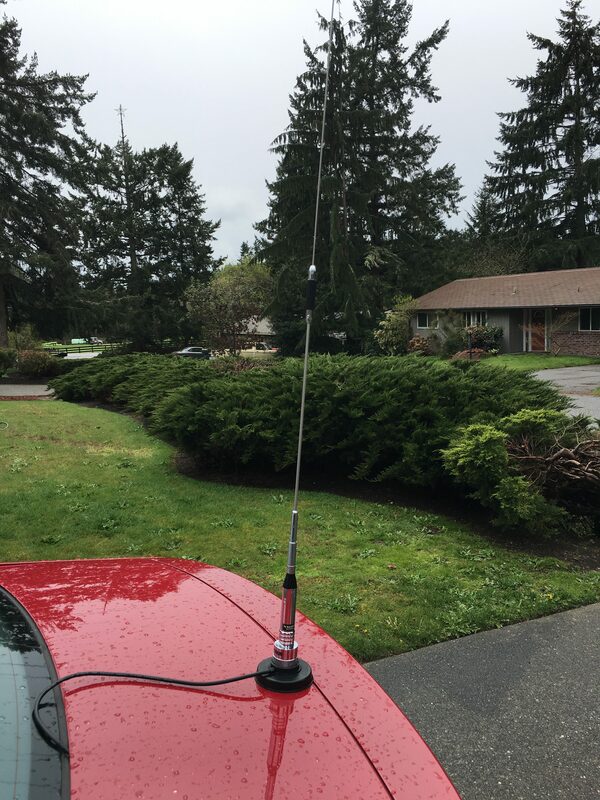 You can also upgrade your antenna for less cost if you decide to add bands with a different radio later. I also had some dual-band antennas (antennas tuned for 144 and 440 MHz) that connect to an NMO mount sitting in the garage. These were perfect for this install because I was only concerned with these two bands. I screwed the antenna onto the base and place the magnet on the trunk of the car. Then, I run the cable into the trunk, under the back seat and between the seats to the area where I want the radio installed. There are many radios from which to choose. Amongst them are several low-cost radios. I use the door above the radio as a mic compartment. This keeps me from sitting on the mic and accidentally transmitting. I had a Baofeng 25×4 laying around that I had not yet installed. The cool thing about this radio is that it isn’t much bigger than the microphone. For newer cars, where dash space is consumed by screens and other controls, a smaller radio will fit into spaces where a larger radio would not. 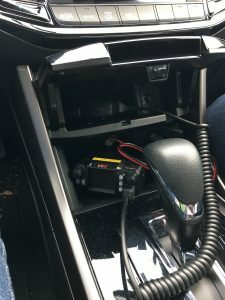 If you’re going with a bigger radio, like the Yaesu FT857D, the faceplate comes off so that you can mount the radio in the trunk and remotely mount the face-plate on the car’s dashboard. On the back of most radios, there is a SO-239 socket. Even though they don’t have the same number, the PL-259 plugs into the SO-239. Once I’ve screwed the connector onto the radio, the radio and antenna are now installed. To power the radio, I did the simplest solution available. I took the cigarette-lighter adaptor and plugged it into the DC socket in the car. The radio is rated for 20A maximum current, so be sure that your socket can handle that current (by checking the car owner’s manual). This solution will get you on the air. There are improvements that could be made to make the installation more permanent and more reliable. A better power solution would be to wire directly to the car’s battery. This solution requires more effort to do in a way that keeps from letting water in. I’ll do another post on this when I do this step on my car. I’ll post pictures and include the steps that keep the power clean and the rainwater out of your car. If you want your antenna to be more permanent, there are NMO mounts that you can place right in the metal of your car’s roof or trunk lid. This requires skill with a drill and can destroy your roof or trunk lid if you don’t do it right. If I get to this point with my car, I’ll post it, along with pictures. I have a cheaper radio in my shack that acts as a base station. A dual band antenna is also cheaper than the tri-bander above. So, if you’re looking to spend less and still have a workable solution, this parts list might do for you.